The above listed item is from the Ptolemaic Period,(332-30 B.C.E.). 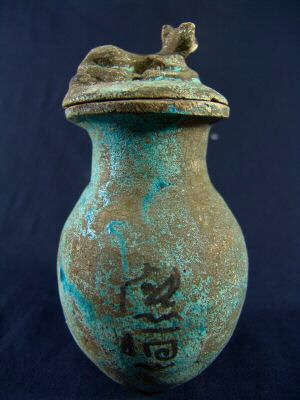 This very rare tomb piece was clay cast, fired, painted and blue faience glazed. We acquired this lovely piece from a select private collection and its provenance is from Alexandria, Egypt. 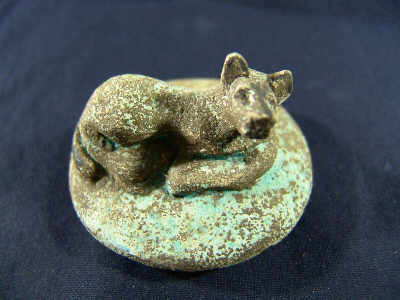 Depicted on the stopper is a reclining Bast or Bastet cat goddess. This type of container was used for offertory unguents(oils) or spices. This jar also has rows of hieroglyphics, front and back, detailed in black paint. 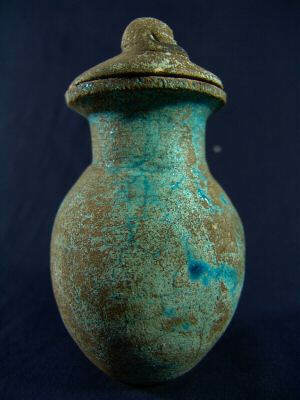 This rare tomb relic is intact, has retained much of its powder blue faience glaze/black paint and has areas of age wear. The reason for the item being available is due to the vast extent of archeological findings, thousands of years in Egyptian burials and also the proliferation of these said items in older private collections worldwide.